Fat quarter packs and bundles of patchwork squares in pre-cut packs of plain and printed cotton material - we take the hard work out of coordinating fat quarters by doing it for you! 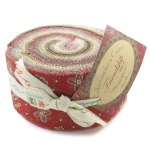 2.5 inch strip rolls in colour coordinated selections of prints and plains, as well as a range of Moda Jelly Rolls and Layer cakes. 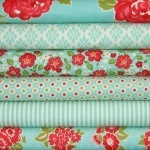 Fat quarter bundles (50cm x 55cm, 20in x 22in approx) of printed fabrics themed by collection or colour. Fabric bundles of small patchwork squares (10in square approx) of printed fabric in colour coordinated and themed selections. 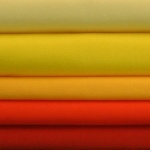 Fat quarter bundles of (50cm x 55cm, 20in x 22in approx) of plain cotton fabric in colour coordinated and rainbow selections. Fabric bundles of small patchwork squares (10in square approx) of plain cotton fabric in colour coordinated and rainbow selections. 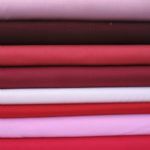 Buying fabric for sewing and quilting online can be difficult, especially the challenge of making sure that the patterns and colours you choose coordinate well. 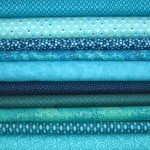 We have put together these pre-cut bundles of fat quarters and smaller quilting squares to make things easier for you! Each pack is made up of prints from a particular collection, or colour coordinated designs from different ranges that can be incorporated into a single quilt with no clashes. Our stash packs are made up of smaller, approximately 10 inch patchwork squares - brilliant to increase your stash without having to buy large pieces of each material. We also have Moda jelly rolls and layer cakes, as well as strip rolls cut in house, perfect for strip piecing patchwork quilts. For even smaller fabric bundles we have charm packs and English paper piecing shapes, click the links to visit those sections of the website. As our shop is based in the UK, our delivery is super fast, so you get to play with the quilting squares as soon as possible! As an added bonus, our fat quarter bundles all offer a 5 percent discount over buying the fat quarters separately, so not only do you get a great selection of matching fabric squares, you also get a real bargain!